A prominent figure in the fight to prove the innocence of Libyan Abdelbaset al-Megrahi for the Lockerbie bombing has said keeping the contents of a 1991 telegram to then prime minister John Major secret until at least 2032 is not in Scotland’s – or any other nation’s – public interest. Dr Jim Swire was speaking to The National after the claim about the document resurfaced. Its contents have been in the public domain for more than three years. It was said to have been written by the late King Hussein of Jordan, who said the group originally suspected of carrying out the December 1988 atrocity – the Popular Front for the Liberation of Palestine-General Command (PFLP-GC) – was responsible. And Aamer Anwar, the Scottish lawyer who is leading the Megrahi family’s bid to clear his name, told The National it was a “vital piece of evidence” that had been withheld from Megrahi’s defence. That view is shared by Swire, who lost his daughter Flora in the bombing. He said: “I can’t make out why it should be in the public interest of the Scots or any other nation for this to remain under public interest immunity (PII) after this long – unless you believe it is in Scotland’s interest to continue to conceal the failure of her biggest international criminal investigation of recent years. “It was the concealment of items such as this which led Professor Hans Koechler [UN observer to the Camp Zeist trial] to describe the proceedings as not representing justice, largely because of the Crown Office’s failure to share evidently significant material with the defence. “The King of Jordan’s communication had been made available to the Crown Office for years before [then foreign secretary] David Miliband placed the PII certificate on it, at the Crown Office’s request. [RB: The Crown Office did not oppose release of the communication. It was the Advocate General for Scotland, acting on behalf of the Foreign and Commonwealth Office, that did so.] I think it is in the Scottish public’s interest to know how Whitehall connived with the Crown Office to ensure that justice was not done at Zeist. Anwar said the Megrahi family case was still with the Scottish Criminal Cases Review Commission (SCCRC) which he expected to report by the end of summer, when he hoped to return to the Appeal Court. He said: “What is incredibly frustrating is the fact that the British government, the authorities, seem to still be maintaining attempts to continue what would be seen as a cover-up and deny critical information to the defence, because we remain the defence lawyers for Abdelbaset al-Megrahi posthumously. All of this information which would go to proving his innocence continues to be denied us. The finger of blame as always pointed at the PFLP-GC. The Crown Office said the PFLP-GC link was considered and rejected at the original trial. A spokesperson added: “The court concluded that the conception, planning and execution of the plot which led to the bombing was of Libyan origin. The only appropriate forum for the determination of guilt or innocence is the criminal court, and Mr Megrahi was convicted unanimously by three senior judges. As the father of Flora Swire, a victim of the 1988 Lockerbie disaster, may I congratulate The Times on its brave attempt to obtain the contents of a telegram sent to John Major as prime minister from an unnamed overseas government (“Lockerbie telegram must remain sealed until 2032”, Scotland edition, Apr 10). It has long been apparent that there are many fatal flaws in the evidence brought to the Zeist court in 2000-01, and used to convict the Libyan Abdul Baset Ali al-Megrahi of being a key perpetrator. Lockerbie remains the worst single terrorist outrage to occur in the UK since the Second World War, yet there has been no inquiry. Those who value the independence of judicial systems from political interference must, like us relatives, be concerned about the reluctance of successive UK governments to allow relevant matters to become public. By 2032 I will be 96, and probably leaning on a cromach to listen. As the father of Flora Swire, a victim the 1988 Lockerbie disaster may I congratulate The Times on its brave attempt to obtain the contents of a telegram sent to Sir John Major as PM, from an overseas kingdom. It has long been apparent that there are many fatal flaws in the evidence brought to the Zeist court in 2000/1, and used to convict the Libyan, Baset Al-Megrahi of being a key perpetrator. During the second appeal by Mr Megrahi against conviction, Scotland's Advocate-General of the day was sent post-haste to confer with then UK Foreign Secretary David Miliband who was persuaded immediately to issue a PII certificate to protect a communication received by Sir John from access by the public or the defence team. This communication to Sir John had been in the possession of the Megrahi prosecution team for years, but denied to Megrahi's defence. Megrahi's second appeal was on the cusp of reaching parts of the evidence in which it might have been highly relevant. At that point Mr Megrahi was offered compassionate release and his appeal was stopped. Lockerbie remains the worst single terrorist outrage to occur in the UK since WWII, yet there has been no inquiry. Those who value the independence of judicial systems from political interference must, like us relatives, be concerned about the reluctance of successive UK Governments to allow relevant matters to become public for so long. By 2032 I will be 94 years old, and probably leaning on a cromach to listen. A decision to keep under wraps a telegram sent to them prime minister John Major three years after the Lockerbie bombing “adds insult to injury” for the families and friends of those who died in the atrocity, according to a campaigner who believes in the innocence of the late Abdelbaset al-Megrahi, the only person convicted for it. The Cabinet Office claimed the contents of the telegram to Major in 1991 were against the national interest – despite the fact that former Scottish justice secretary Kenny MacAskill put them into the public domain almost three years ago in his book The Lockerbie Bombing: The Search for Justice. Officials refused a Freedom of Information (FoI) request from The Times newspaper, which means the document will be kept secret at the UK National Archives, at Kew in London, until at least 2032. Their response read: “In this instance, we believe the release of the information received in confidence would harm UK relations with the country which provided the information. “This would be detrimental to the operation of government and would not be in the UK’s interest. The material is covered by a controversial public interest immunity (PII) certificate, which was signed in 2008 by then foreign secretary David Miliband. It was identified as important to the defence of Megrahi by the Scottish Criminal Cases Review Commission (SCCRC), which granted his appeal after the Crown failed to disclose details at his 2002 trial. In his book, MacAskill said the telegram to Major, above, was from the late King Hussein of Jordan and blamed the bombing on the Popular Front for the Liberation of Palestine – General Command (PFLP-GC), the group originally suspected of carrying it out. Records at the National Archives confirm that Major received a telegram relating to the bombing on November 15, 1991 – the day after the British and US governments announced they were bringing charges against Megrahi and his co-accused Lamin Khalifah Fhimah. 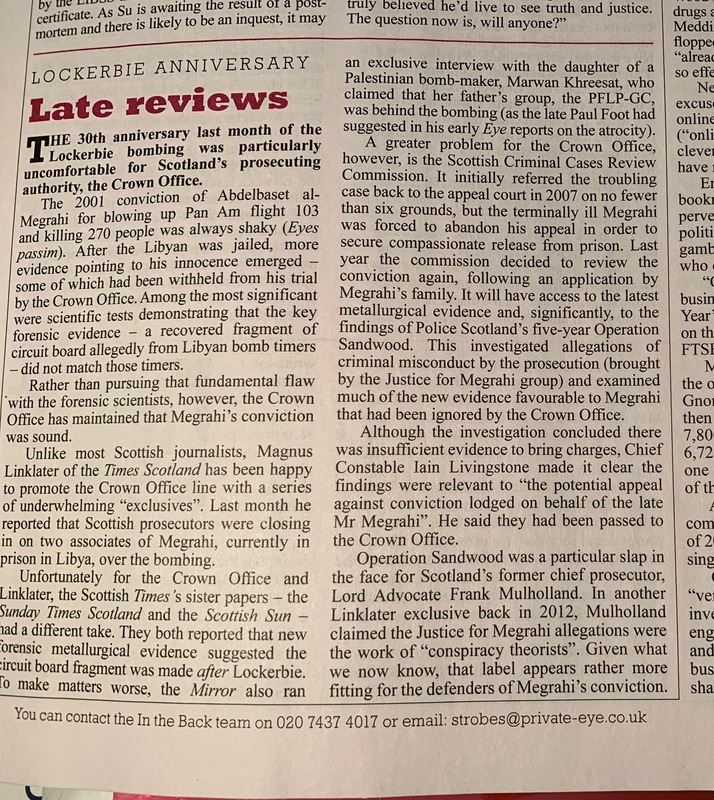 Iain McKie, from the Justice for Megrahi (JfM) group, which is campaigning to clear the Libyan’s name, said: “It beggars belief that the UK government, after 30 years of widespread and well-founded doubts about various aspects of the Lockerbie investigation and trial, continues in its efforts to hide the truth about the tragedy. “That it should claim to be protecting the public interest only adds insult to injury for the family and friends of the 270 souls who perished. “Why would they claim it was in the public interest in keeping this material quiet until 2032? “In some ways it heightens – not lessens – suspicion. MacAskill told The National there was “no good reason” to keep the contents secret, given that Hussein is dead. He said: “It can hardly exacerbate the situation in Jordan. Ministers have refused to disclose the contents of a telegram sent to the prime minister three years after the Lockerbie bombing, claiming it would be harmful to Britain. A message sent to John Major in 1991, containing information about the atrocity from an unnamed overseas government, is held at the UK National Archives at Kew, west London. An application made by The Times to view it has been rejected on the basis that it would be damaging to national interests. The cabinet office’s dismissal of the freedom of information request means the document will remain closed to the public until 2032 at the earliest. It has fuelled suggestions from campaigners that evidence relating to Britain’s worst terrorist atrocity is being concealed. Freedom of information requests are meant to be ruled on within 20 working days. It took almost six months before ministers finally decided that the telegram could not be brought into the public domain. A response to the request says: “In this instance, we believe the release of the information received in confidence would harm UK relations with the country which provided the information. This would be detrimental to the operation of government and would not be in the UK’s interest. Robert Black, a legal expert who helped to establish the Lockerbie trial, has raised concerns about a lack of transparency from successive UK governments. 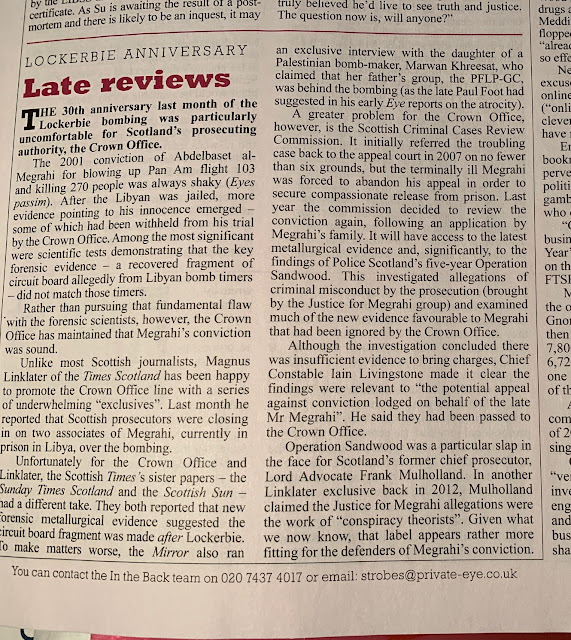 Iain McKie, of the Justice for Megrahi group, said: “It beggars belief that the UK government, after 30 years of widespread and well-founded doubts about various aspects of the Lockerbie investigation and trial, continues in its efforts to hide the truth about the tragedy. More than 50 government files relating to the bombing on December 21, 1988, are held at the archives. Late last year a file containing records from the prime minister’s office relating to the “Pan Am 747 air crash” was declassified and listed in records as available to view. When The Times asked to see it, reporters were told that it had been retained by the government on an indefinite basis. Dozens of other files, listed under “Aviation security: destruction of Pam Am, Flight 103”, have been closed until 2032. Applications to view them are met with a notice saying that they are “closed and retained”. [RB: I suspect that the document in question is, or is related to, the one from King Hussein of Jordan in respect of which then Foreign Secretary David Miliband issued a public interest immunity (PII) certificate barring disclosure to Megrahi's legal team in the run-up to his second appeal: https://lockerbiecase.blogspot.com/2016/06/bombshell-book.html. Since December 1988 when my beloved daughter, Flora, was murdered at Lockerbie I have searched diligently for the truth as to why the warnings that Pan Am was to be attacked had not been heeded. A detailed warning from West Germany in October 1988 told our government that improvised bombs had been recovered near Frankfurt which, though stable on the ground, if put anywhere aboard a plane would automatically sense take-off and explode 35 to 40 minutes later. My daughter’s doomed flight flew for 38 minutes before exploding over Lockerbie. None of the families knew of the warnings received beforehand. Yet the US’s Moscow embassy had given permission to staff to abandon Pan Am 103. The 747 was only two thirds full that night. Margaret Thatcher forbade an inquiry and no subsequent prime minister has allowed one, often on the basis that “there is an ongoing criminal investigation” now alleged to involve the Stasi. At the trial at Camp Zeist in the Netherlands that convicted Abdul Baset Ali al-Megrahi a piece of timer circuitboard was produced by Scottish police as evidence. It seemed to implicate a Swiss maker of digital timers. These had been supplied not only to Libya but to the Stasi. Since 2012 we have known that whatever its origin, the metallurgy on that fragment cannot be matched to that in use in Switzerland. This link between the Stasi and Lockerbie does not exist. Before he died, a key leader of the Scottish police investigation told the world that “he would like to wring the neck of anyone who disagrees with the police findings”. We have met many important people who tried to help. Nelson Mandela warned us that “no one country should be complainant prosecutor and judge”. Douglas Hurd, the Tory home and foreign secretary, referred to us in cabinet as responsible people who should be kept informed. Cecil Parkinson, the transport secretary, protected me from acquiring a criminal record when I demonstrated post hoc that Heathrow’s security had still not improved, by attempting to board an aircraft with a fake bomb, and Robin Cook, the Labour foreign secretary, talked to the families and seemed to favour an inquiry. What have we done to deserve this extra burden of unknowing, piled upon that terrible bereavement? Margaret Thatcher privately begged President Reagan two years before the Lockerbie bombing not to attack Libya, warning it would unleash a bloody “cycle of revenge and counter-revenge”. In 1986 Britain took the controversial decision to allow the US to use RAF bases to launch a raid on Colonel Gaddafi’s regime. However, secret documents newly released and placed in the National Archives in Kew, show the prime minister was deeply troubled by the plan and outlined her concerns in a series of frank “Dear Ron” letters. Pan Am Flight 103 was blown up over Lockerbie in 1988 and Abdul Baset Ali al-Megrahi, a Libyan national, was convicted for the atrocity in 2001. It was confirmed yesterday that prosecutors from Scotland had interviewed five retired Stasi agents in Germany over their possible involvement in the bombing, which killed 270 people, including 190 US and 43 UK citizens. Investigators do not believe al-Megrahi acted alone, while campaigners insist he was the victim of a miscarriage of justice. According to reports in Germany, the ex-agents were in their 70s and 80s, and were interviewed over the past nine months. Thatcher responded: “Dear Ron . . . as you know my instinct is always to stand beside the United States, but what you say in your message causes me very considerable anxiety. My worry is that this risks getting us into a cycle of revenge and counter-revenge in which many more innocent lives will be lost. US F-111 jets launched raids on Tripoli and Benghazi from RAF bases in Suffolk and Oxfordshire. The actions caused an international outcry. Scottish investigators want to speak to nearly 20 former East German secret police officers over alleged links to the Lockerbie bombing, it has been claimed. Seven retired Stasi agents, now in their 70s and 80s, have reportedly been interrogated already, more than 30 years after the crash which killed 270. Detectives are said to believe that the Stasi could have helped to supply the timer on the bomb, which brought down Pan Am flight 103 over the Scottish town in 1988. The secret police could also have provided ‘logistical support’ for the attack, German newspaper Bild reported. Scottish detectives have reportedly sent dozens of requests to authorities in former East Germany to speak to retired agents. Seven who live near Frankfurt/Oder are said to have been handed over and questioned already, with investigators from Edinburgh present. Libyan intelligence officer Abdelbaset al-Megrahi was found guilty of murdering the 270 crash victims in 2001. It has long been suggested that then-Libyan leader Muammar Gaddafi ordered the bombing, although he denied it. However Libya could have had help from East Berlin, where the Stasi are known to have supported terror groups. At the Lockerbie trial in 2000 the court heard that the Swiss businessman whose company supplied the timer had links to the Stasi. The Stasi are known to have given assistance to members of the Red Army Faction, a far-left terrorist network active in West Germany in the 1970s. Former left-wing terrorists were given shelter in East Germany and given new identities, according to the government of reunified Germany. Stasi agents were also linked to a 1986 disco bombing in West Berlin, which was also connected to Libya. Many believe the Lockerbie atrocity was committed in revenge for the downing of an Iran Air passenger flight by a US missile cruiser earlier in 1988. Megrahi was released from prison on ‘compassionate grounds’ in 2009 and died in Tripoli in 2012. However Megrahi’s family are still pursuing a possible appeal against his conviction. [RB: I do not know what connection, if any, this has to the European Investigation Order obtained by the Scottish Criminal Cases Review Commission on 13 March 2019. Federal Republic of Germany to obtain the evidence specified therein. "... the FBI was put in charge of the crime scene in Lockerbie"
The plane with 200,000 pounds of fuel carrying 259 people was at 31,000 feet flying 500 mph. When a Semtex device of about 1 pound exploded, all aboard and 11 on the ground were killed. The crime scene was scattered over 845 square miles, which is roughly just smaller than Bladen County. “We initially had three theories,” said Kelso, who retired in 2002. “One was a suicide bomber, someone knowingly checked in the device. The second was a mule, which is a situation, for example, of boyfriend and girlfriend. Someone says if you take some of my luggage, I’ll join you later. The mule is the one who takes the luggage. The agency’s investigation had a lucky break and a mystery letter, elements that seem to often accompany movie thrillers and good books. The break was two-fold, that the airplane didn’t take off on time and the explosive device was a straight timer as opposed to a barometric device. Kelso told the group he’s met with families of those killed. The meetings were emotionally draining. At Syracuse University, which had several students onboard, an anniversary is held each year. Kelso and his wife have stayed in touch with one family, connected as parents of twins. “One was a student at Syracuse, one at Rensler — both on the same flight and were killed,” Kelso said of the parents’ sons. “They both keep hoping, as do I, that there will be a stable government in Libya to help us get to the bottom of this. We indicted two, and convicted one, but we know there is more to this. "... it became clear that there wasn't going to be any survivors"
A Largs chaplain who witnessed the horrors of the Lockerbie bombing says he believes the tragedy was God preparing him for life as a minister. Pastor Gordon Weir, 51, told the News how he is still haunted by the horrific scenes in the town straight after the bombing of Pan Am flight 103 in 1988. He was living in Dumfries and working as clerk for the health service, delivering equipment and ensuring the region's hospitals and GP's were well stocked. Gordon, of Brisbane Evangelical Church, said: "The night it happened I had just got home from work when the phone rang. "It was my boss telling me he had called me a taxi and I had to get back in to work. I thought he was joking, but right enough there was a taxi outside my door. "I got the story on the way in, that a jet had fallen from the sky and crashed in Lockerbie and that we had to set the hospital up for any emergencies coming in. "Five people came in who had been on the ground and been hit with flying debris and we helped them. We were waiting for people from the plane, but as the night went on it became clear that there wasn't going to be any survivors. "The next day myself and another worker were asked to take x-ray equipment to Lockerbie. "They were going to use it to identify bodies in the wreckage. "I will never forget driving in to the site, with the police combing the fields for bodies while in the main street it was packed with camera crews from across the world. Within 12 hours the whole world had arrived in the little town. "I will never forget it. I saw some horrific things, there were still bodies lying and police were still trying to identify them. "I think in a weird way, although I didn't know it at the time, seeing those people dealing with real trauma, was God preparing me." It was eighteen years ago today that the judges of the Scottish Court at Camp Zeist delivered their verdict of Guilty against Abdelbaset al-Megrahi (and Not Guilty against Lamin Fhima) for the murder of 270 people in the bombing of Pan Am 103 over Lockerbie. The Opinion of the Court justifying the verdicts can be read here. In the version originally issued on 31 January 2001, in the very first sentence, their Lordships mis-stated the date of the disaster. This is symptomatic of the quality of the Opinion as a whole. Did Kenyan minister feature in Lockerbie bombing saga? ... on November 14, 1988 he left for a four-day State visit to Iran. The No 2 passenger in the manifest of the presidential jet was Foreign Affairs minister Robert Ouko. Media reports at the time showed the Kenyan President was thrown a red carpet welcome by his Iranian counterpart and visiting factories outside the capital Tehran. On returning home, President Moi said Kenya would be selling more tea to the Middle-East country and would support the Palestinian cause. Never mind within weeks of the visit, Kenya resumed diplomatic ties with Israel which had been “severed” 15 years earlier. Nothing else was said about the Iran visit by the Kenyan President. Then Lockerbie happened. At seven in the evening London time, Pan-Am passenger airliner Boeing 747 flew out of the Heathrow Airport en route to New York. Undetected in the luggage compartment was a suitcase containing a cassette-player. Inside the gadget was an odourless plastic explosive with an atmospheric timer. In about 40 minutes, the flight climbed to the trigger height — 31,000 feet above sea level — over a village near Lockerbie town in Scotland. Then hell rained. The bomb exploded, breaking the plane into a thousand pieces that scattered over a kilometre radius. The intact part of the fuselage hit the ground with such a force it created a medium-sized crater. Two hundred and seventy lives were lost. A month after the tragedy, the British periodical well-known for juicy leaks, the Private Eye reported that among the passengers in the ill-fated US airliner were officers from the US Intelligence outfit, the CIA, who had been in Iran to negotiate a secret deal to release American and other western foreigners held hostage in Iran and Lebanon. The report went further to say that during the visit to Iran by President Moi a month before the Lockerbie tragedy, it had been agreed with Iranian authorities that Dr Ouko be one of the go-betweens in the Iran/US secret negotiations. The rationale was that Dr Ouko could be trusted as an honest broker by both Iranian and US diplomats with whom he had struck friendship in his role as Kenya’s foremost diplomat. In the Lebanon hostage crisis, [President Ronald Reagan] started circumventing the law that restricted arms sales to Iran. He did so by having the CIA secretly sell arms to Iran and divert part of the proceeds to fund anti-communist rebels in then rogue Central American country of Nicaragua in what was called the Iran/Contra affair. From the story in the British publication, the Private Eye, it would appear President Reagan also had other spanners in work in the Lebanon hostage crisis and where Kenya was looped in. Dr Robert Ouko would mysteriously disappear, only to be found murdered slightly over a year after the Lockerbie tragedy. Incidentally, he had just come from a trip in the US with the President [Moi] when he vanished. Libya would be accused of having masterminded the Lockerbie terrorist bombing of the US jetliner and forced to surrender, after long drawn pressure, two of her citizens for trial in Scotland, and also to compensate victims of the plane explosion. The story was that Libya did so to revenge the bombing of her cities of Tripoli and Benghazi ordered by President Reagan two years before Lockerbie tragedy. But five years ago, a former Iranian intelligence officer disclosed that it was Iran, working with Syria, that organised the Lockerbie bombing to revenge what was called “accidental” downing of an Iranian civilian jet by a US warship, killing 290 people five months before the Lockerbie tragedy. All in all, nothing has ever came out clearly on who did what and why in the Lockerbie matter — least of all Kenya that was at some point looped in the murky affairs of the powder keg that is the Middle-East.